While I am at the helm of my company, I do not do all the busy work involved. My job is to build the business and let my staff run our company. This is what I talked to you about earlier about working on your business and not in your business. 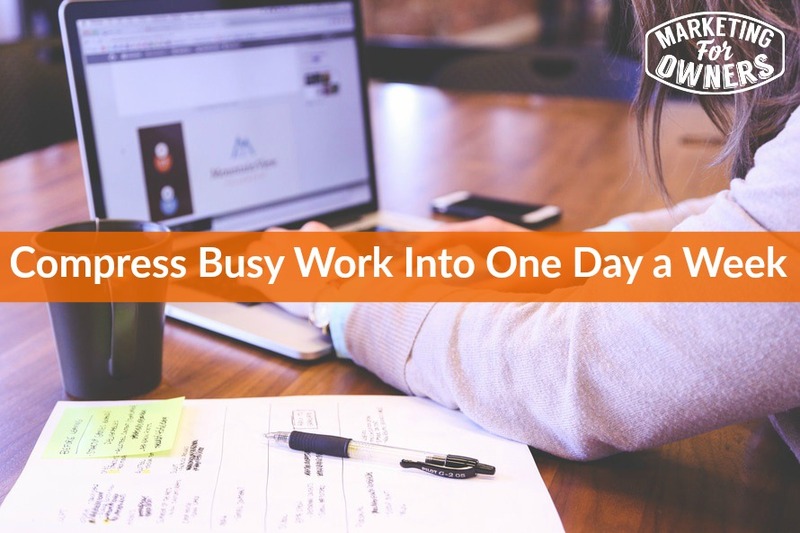 Today though, we are talking about how to compress all your busy work into one single day. We call this batching your work. Busy work is generally all the stuff you do that is not making you money, but stuff that just has to get done. Yes — every business has things that MUST be done. Even if you are hiring employees, part of your time is spent training them — which is something that must be done. So — I am going to help you out by showing you how to imply the 80/20 rule in your business. If you look up Richard Koch, he shares how this rule basically dictates much of what happens in life. Basically 80% of your revenue comes from 20% of your customers. Also – 80% of the hassle you get will come from 20% of your customers. For your email as an example — 20% of your emails are worth reading and doing, and the other 80% are not. So — to compress to one day a week, look at everything you have to do in a day, go down the list and prioritize. Now, what I mean by that is just sort it to what is most important. When you look at what is most important, you are going to have to look at what needs to be prioritized. Let me suggest that you follow the money because in your business, the whole point of all of this is to earn money so you can have a good lifestyle. You need to be able to have a comfortable life with your family and to enjoy life. It is why you are in business for yourself right? If you chase the money and do things that will get the sale and get money in the door quickly, then you are doing what needs to be done. For example with your email — you need to only answer the emails that are to do with customers. You can let someone else answer the other emails, but your priority are the customer’s emails. If you are doing work, you can write out everything you have to do and prioritize. You can label them as important, medium important, and not important. Then, write next to them “money or not money”. If it will result in customers, then you need to mark that as money — because customers bring in money. What this helps you to do is to cut down on all your menial unimportant tasks and start focusing on the 20% that really matters. Then the other things that don’t matter if you don’t do them, you will find that if they don’t matter for a few days that they eventually disappear. Then you start shortening your todo list. It is all about prioritizing my friend. Today is Thursday and that means that it is time for a drive time podcast. 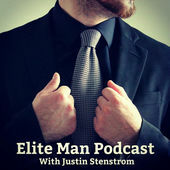 I am recommending Justin Strenstrom. I interviewed him recently and he has a really nice demeanor. His podcast is called Elite Man Podcast. He interviews and chats with some of the best minds in the business, lifestyle, health, fitness, and social world. I will be back tomorrow with a fabulous interview, so be sure to tune in.